My name is Roberto Waldteufel - I am Wyllie Draught's programmer and the creator and webmaster of this web site. I live on the Isle of Jura, a beautiful and remote Hebridean island off the West coast of Scotland. I am a mathemetician and computer programmer, and my interests include artificial intelligence, acoustic blues guitar playing, and board games such as chess and draughts. My first experience of programming was before the days of home PCs - I was lucky enough to be allowed access to a university mainframe computer where I learned to program in Fortran using punched cards. 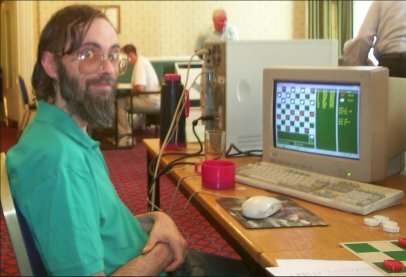 Later when I had my own computer at home I experimented with programming various games of skill, including Poker, Qubic (3-dimensional 4x4x4 tic-tac-toe/noughts and crosses), Connect-4, Chess and of course draughts. As well as programming board games, I have also composed several chess endgame studies and a couple of draughts problems as well: The Royal Tour and The Boston Strangler.